Pheasant has a slight tendency to dryness but pot-roasting it like this, with plenty of rich chorizo to provide a little fat and extra flavour, ensures a very satisfying result. The butter beans are a fine addition: they soak up all the flavours of the meat, wine and herbs and then you can mash them deliciously into the juices on your plate. If you prefer, you can joint the pheasants and brown the individual pieces rather than the whole birds. This recipe works brilliantly for a couple of jointed rabbits, too. Place a large flameproof casserole (one that will accommodate both birds) over a medium heat and heat the butter with 1 tablespoon of the oil until foaming. Add the onions, garlic, thyme and bay leaves and cook for 10 minutes, until the onions are soft and slightly golden. Heat the remaining oil in a large frying pan. Season the pheasants all over with salt and pepper, add to the pan and brown on all sides over a high heat for 3-4 minutes. Transfer to the casserole. Add the chorizo to the frying pan and fry for 3-4 minutes, until browned, then add to the casserole too. Deglaze the frying pan by pouring in a little of the wine and stirring to scrape up any bits from the base of the pan. Add to the pheasants with the rest of the wine, the stock and the butter beans. The liquid doesn't need to cover the birds but it should come at least halfway up. Bring to a simmer, cover and place in an oven preheated to 140°C/Gas Mark 1. Cook for 2 hours, until the birds are tender. 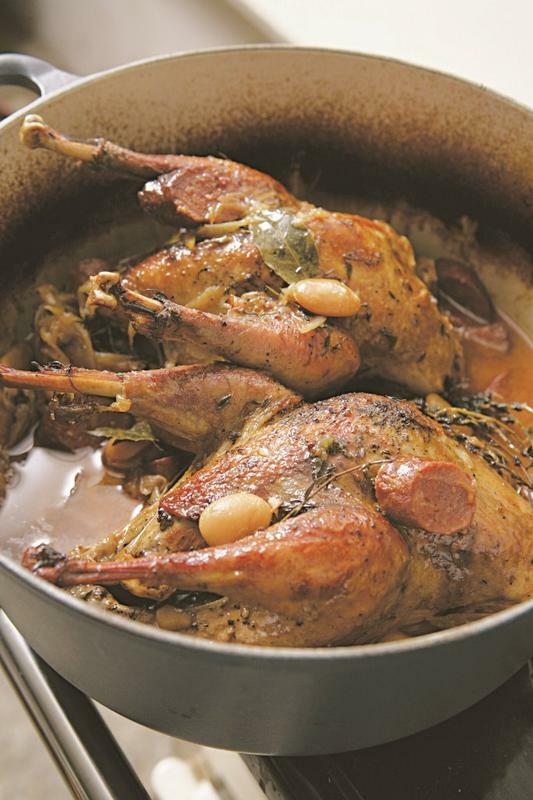 Remove the pheasants from the casserole and leave to rest in a warm place for 15-20 minutes. If the chorizo has released a lot of fat, skim some off the juices in the pan. Cut the birds into halves or quarters and divide between 4 warm plates. Spoon over the chorizo, beans and sauce, and serve with mash or lots of bread.